Cedar House Inn named Trip Advisor’s #1 Bed & Breakfast in America! Cedar House Inn is a classic Victorian home built in 1893 which features the antiquity of the era enhanced with modern conveniences. Located in the iconic historic district of America’s oldest city, the impressive property offers eight romantic guestrooms, wrap around porches, and a daily sumptuous two course gourmet breakfast. The Inn, situated within walking distance of St. Augustine’s many attractions and world-class restaurants, is ideally located for exploring Florida’s historic First Coast. Cyndi Humphrey, the current owner/operator of Cedar House, credits this award to a shared commitment by a 5-star team dedicated to creating once-in-a-lifetime memories for their guests as well as the guests who have contributed reviews to TripAdvisor. “I’m thrilled that the Cedar House Inn has been recognized as another feather in the cap of our historic, beautiful city. We’re privileged to carry on the legacy of the previous owner’s vision for the inn and proud to be part of a business community that makes the City of St Augustine an incredibly popular place to live and visit,” says Humphrey, a former executive of The Ritz Carlton, The Four Seasons, and SVP for a major league baseball team owner. 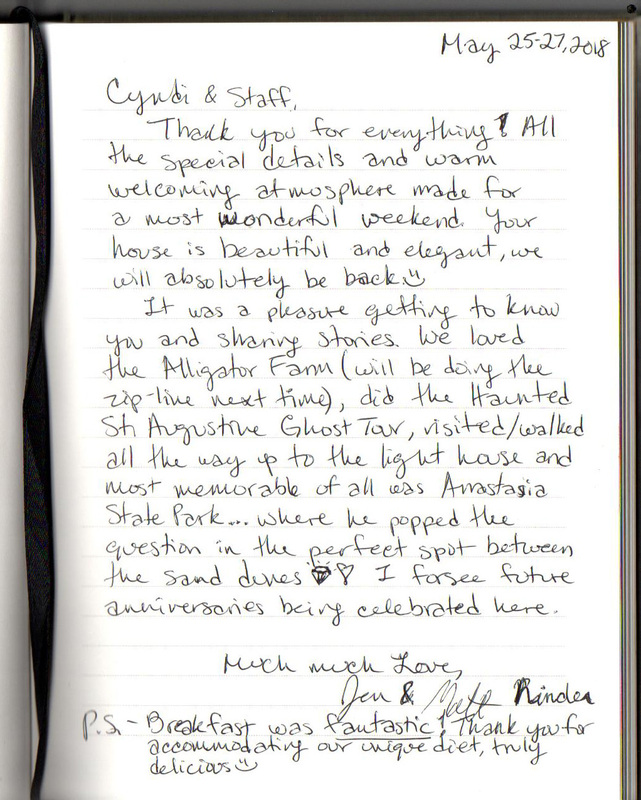 Cedar House Inn’s accolades also include the St. Augustine Record’s “Best of St. Augustine, Bed & Breakfast” for the past 8 years. Historic St. Augustine, Florida is known for its history & romance, boasting 26 unique bed & breakfasts as well as numerous attractions, events and activities.